Since 1981, the MacArthur Foundation has bestowed its “genius grant” on 873 (ostensibly) geniuses—“talented individuals who have shown extraordinary originality and dedication in their creative pursuits and a marked capacity for self-direction,” reads the MacArthur Web site. But is this the truest definition of “genius”? Considering that the title is so commonly conferred upon basketball coaches, celebrities and rock stars (a recent Rolling Stone article referred to Kanye West as a “mad genius”—seriously), is being a “genius” even that impressive anymore? 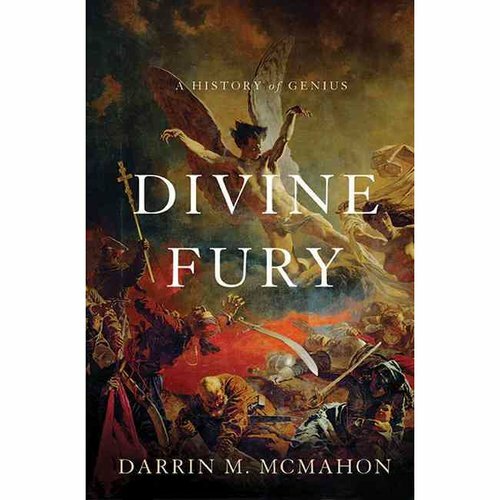 In Divine Fury, historian Darrin M. McMahon isn’t questioning MENSA credentials so much as tracing the history of this loaded term and how it’s changed over the centuries. Whereas contemporary culture views genius as something you possess, ancient philosophers believed the inverse: Genius possesses you. More specifically, a demon possesses you, for good and ill, and this was the belief for centuries. McMahon documents many cases of “genius,” from the ancients to modern times, and how the concept evolved and then devolved into our current celebrity-obsessed culture. It’s a curious evolution, and one I wouldn’t have thought about much before reading Divine Fury. McMahon deftly illuminates this secret and complicated history through literary accounts, keen observation and a strong narrative. His writing can be a bit tangential and academic at times—but hey, the man’s an academic! What do you expect? I certainly wasn’t expecting to think about genius as a populist concept, but there it is. In some ways, the history of genius is the flow of agency from the elite to the proletariat. While I would rate that as a good thing, an unfortunate consequence is that genius has become just another noun that anyone can claim. The change is due in part to advanced medical knowledge. In ancient Greece, Socrates believed a demon was whispering in his ear. Today, we’d slip him some Paxil. Or give him his own TED talk. Ultimately, it remains a fuzzy line between madness and genius. Is it the possessed or the possessor? Are 98th percentile test-scorers (the threshold for MENSA membership) the elite or merely outliers? Or is each of us capable of becoming an Einstein? No matter, from now on I’ll be slower to label someone a genius. Unless that “mad genius” Kanye West splits the atom in his next video.